In his last major address to His disciples before His passion, our Lord said that upon His ascension, the Father would send “another Comforter” in His name (John 14, KJV). This Comforter is not one who offers mere consolation, but is rather the Holy Spirit of God who comes alongside His people with strength to overcome the world. Because Christ has overcome the world and given us His Spirit, we can face the worst that the world throws at us. Yet sometimes we have difficulty seeing Christ’s reign over all things. Moreover, we don’t always stand with the boldness that we should have in light of our service to the One who has overcome all of His and our enemies. On March 13-15, 2014, we hosted our annual conference in Orlando, Fla. addressing the theme Overcoming the World: Being a Christian in a Post-Christian Culture. Voddie Baucham, Sinclair Ferguson, W. Robert Godfrey, Steven Lawson, Albert Mohler, Stephen Nichols, R.C. Sproul, and Derek Thomas considered how we can overcome a world that wants to overcome us. 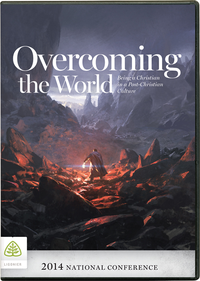 The messages in this series cover Christ’s victory over the world, how the church has stood firm in history against unbelief, what it means to be in the world but not of the world, how we are to engage non-Christian worldviews,the gospel’s answer to the “new” sexual ethic, and other topics.